John Baldessari’s current exhibition is a welcome greeting to Sprüth Magers gallery in Los Angeles. It opened the new space. Working together for the milestone of taking root in Los Angeles, is a strong proof of the artists and the gallery’s solid collaboration. Suppose it is true after all? WHAT THEN? is the hand-painted phrase that his Baldessari’s text paintings series started with in 1966. Fifty years later, the artist is as humorous and playful. The exhibition blends photographic material with sentences in a distinctive Baldessari collage way. MAYBE THAT IS THE SIMPLEST WAY TO EXPLAIN IT. comes with a photo collage of intertwined feminine legs and arms while BEN’S JACKET DRAPES PERFECTLY OVER HIS SHOULDERS underlines a woman lying on a deck chair watching a pop painted horizon. 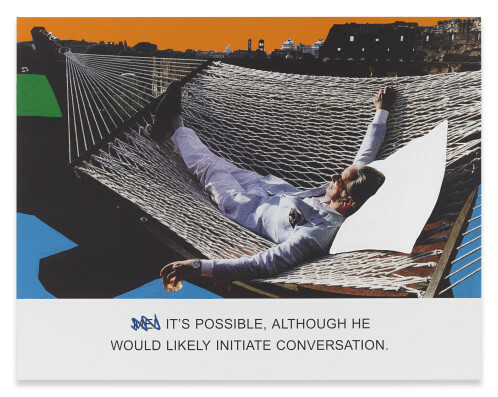 Each of Baldessari’s association are interconnected to give way to a narrative space going beyond the picture.